HSM, the global manufacturer of components and provider of integrated solutions to the transportation, furniture, bedding and a growing number of diversified markets, treated 75 school bus drivers to breakfast on Feb. 11 as part of North Carolina's Love the Bus celebration. Love the Bus events are being held nationwide all month in celebration of school bus drivers and the benefits of school bus driving. 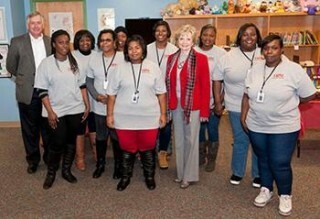 North Carolina State Superintendent of Public Instruction June Atkinson recently helped Wake County Schools honor its bus drivers by riding on a school bus taking students to Herbert Akins Road Elementary School in Fuquay-Varina, North Carolina, on February 11. After arriving at the school, she joined 75 bus drivers from the Fuquay-Varina School District for a breakfast sponsored by HSM, a supplier of school bus seating products based in Hickory, North Carolina. David Murphy, market manager, HSM Transportation Solutions, also provided the drivers with HSM T-shirts featuring the Stop for a Life logo, which highlights the need for motorists to obey the school bus stop arm law. The Love the Bus program, founded in 2007 and coordinated by the American School Bus Council, raises awareness and appreciation for the hundreds of thousands of school bus drivers who provide transportation for the 25 million school children who ride more than 480,000 school buses each day. It also provides an opportunity for parents and children to learn more about the safety and environmental benefits of school bus transportation. Nationwide, school buses represent 25 percent of the miles traveled by students in this nation but account for less than 4 percent of the injuries. To learn more, visit www.LoveTheBus.com. To learn more about HSM Transportation Solutions, visit www.hsmsolutions.com/markets/transportation.